Martha Jane was born about 1855 in Walton, Eaton County, Michigan. She was the half-sister of George Jackson, William H. & Sybilla Long. 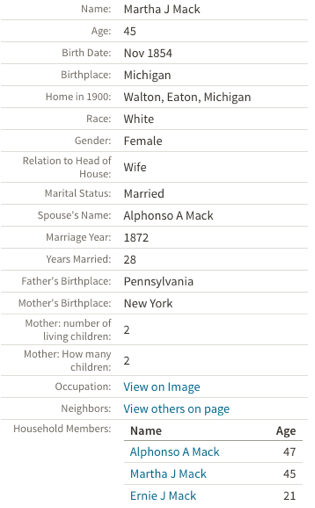 The mother of these last three children was Sarah Ann Piper who was born in England and who lived in Delaware before she married John R. from Pennsylvania. 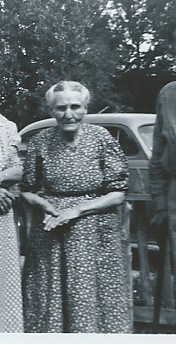 Martha’s mother was Nancy M. Parker. 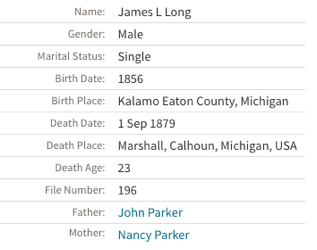 After the death of John R. Long in 1862, Nancy Parker remarried with Sidney Falling. 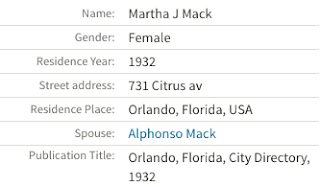 From the 1987 Census in Walton, we learn that Martha Jane is 15 years old. 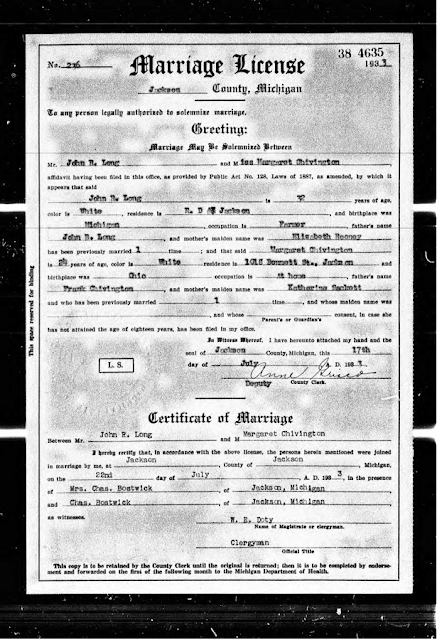 The following screenshot of the marriage certificate shows that Alphonso was 19 years old and Martha Jane, 17. 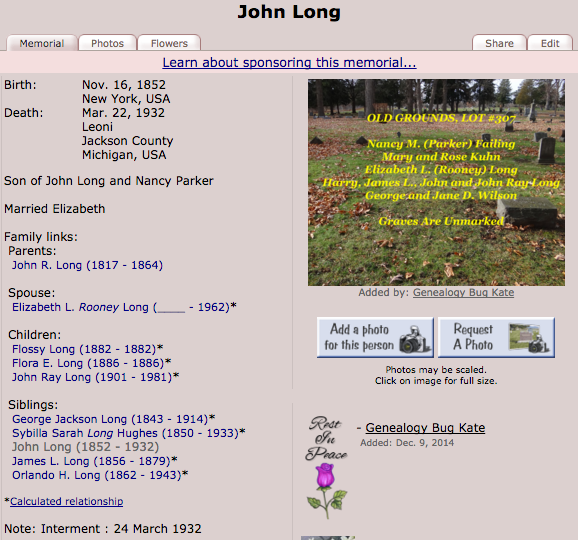 The next screenshot shows that John Long was a witness at Martha’s marriage. He was probably her brother. 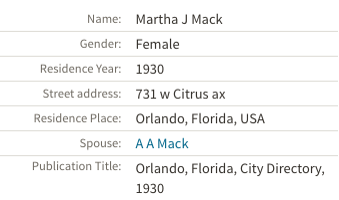 of their child, Eva Gertrude Mack. 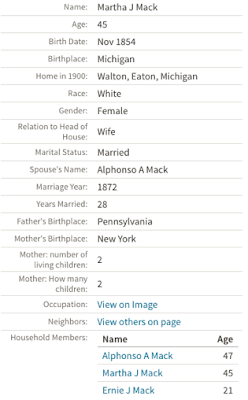 Alphonso & Martha Jane had two children while they were living in Corwith: Gertrude (1872) & Verne (1879). it should be Verne instead of Ernie J. 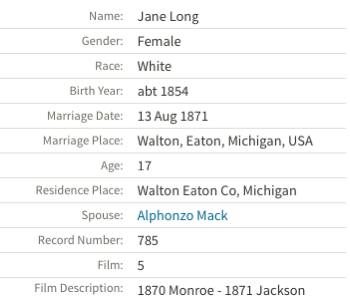 In 1920, Alphonso & Martha Jane were still living in Walton, MI. The following document is about the death of Alphonso Mack on the 11 May 1924 in Walton MI. The following three screenshots are about Martha Jane living in Orlando Florida. 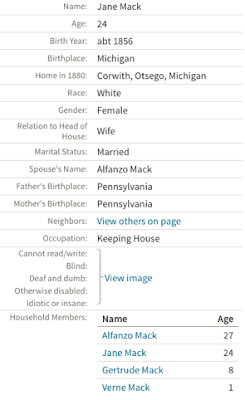 In all these cases, it is said that Martha Jane was a widow. 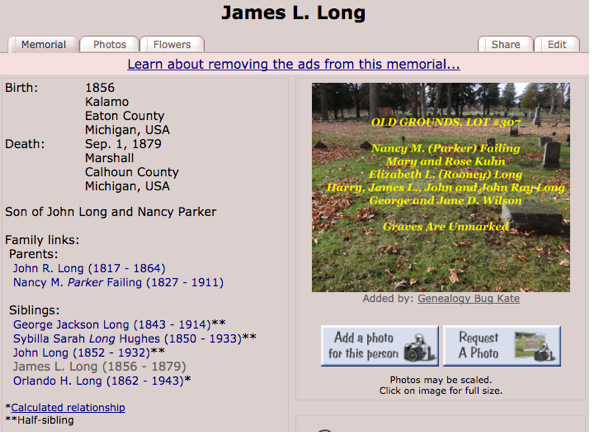 James L. Long was the son of John R. Long & Nancy M. Parker. 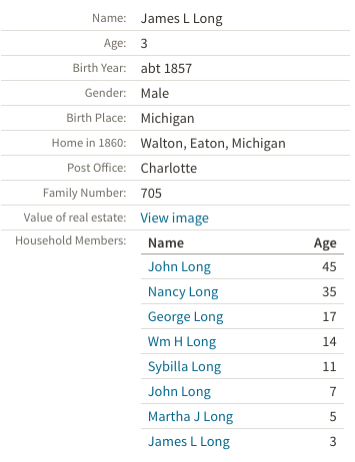 As the following 1860 Census in Walton is showing, James L. was born in 1857. 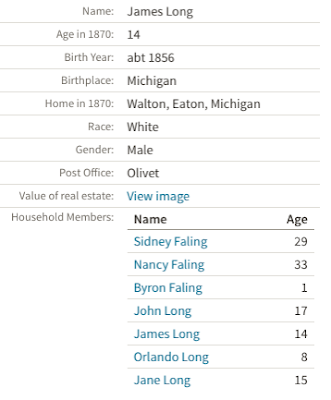 In the 1870 Census in Walton MI, James L. was 14 years old. 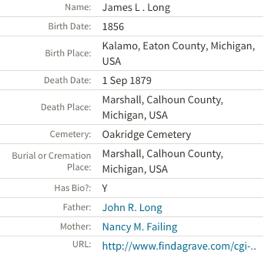 James L. died on September 1, 1879 in Marshall, Calhoun County, MI. He was a Railroad employee. James L. is buried with many members of his family in the Oakridge Cemetery of Calhoun Co MI. We learn from the following document that he was born in Kalamo, Eaton County, MI. 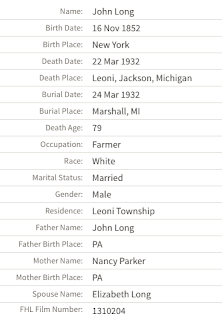 John was the first son of John R. & Nancy M. Parker. He was born in New York in 1853. NB. The age of Nancy Faling in the following 1870 Census should be 43 instead of 33. 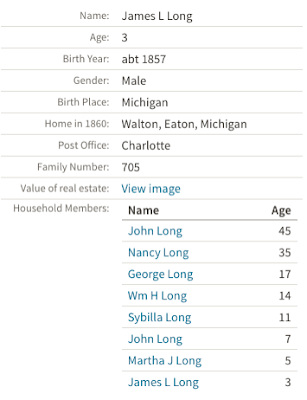 John, the son of John R. was also called John R.
we learn where each member of the family was born. John Long could have been married twice and not only once. He would have been married first to Marion Doolittle who lived in the same community. The marriage took place in Walton on the 23 November 1872. He was 20 years old. The marriage certificate is quite revealing. Alfred & Marion Doolittle were siblings. They married on the same day. Not only they married on the same day, but each couple served as witnesses for the other couple. 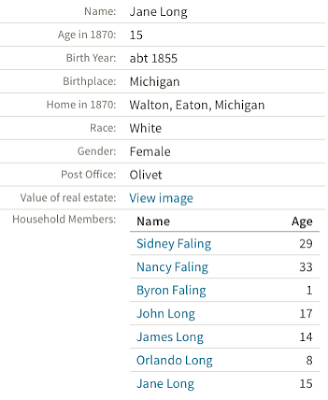 1860 Census in Nankin, Wayne MI. 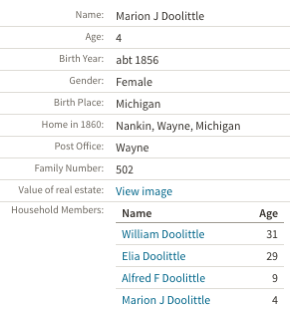 Marion Doolittle was born in Wayne MI in1856. 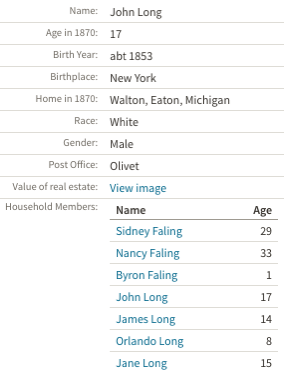 1870 Census in Walton MI. Marion & Alfred were the children of William & Elizabeth. 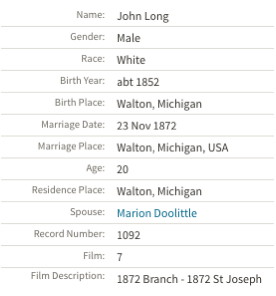 On the marriage certificate, John is said to be 20 years old and Marion, 17. 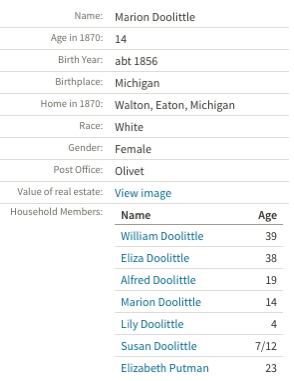 The Doolittle family in the 1880 Census of Clarendon MI. Marion does not live with her parents anymore. 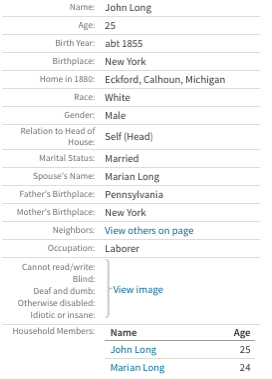 John & Marion Doolittle lived in Eckford Calhoun County, Mi at the 1880 Census. John & Marion lived next door to Sidney & Nancy Failing. This document shows that Marion was related to the Long family and that she married twice. 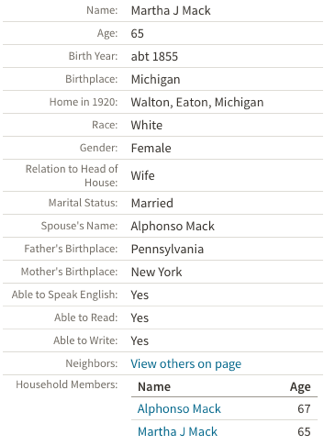 Marion Doolittle lived to be 100. 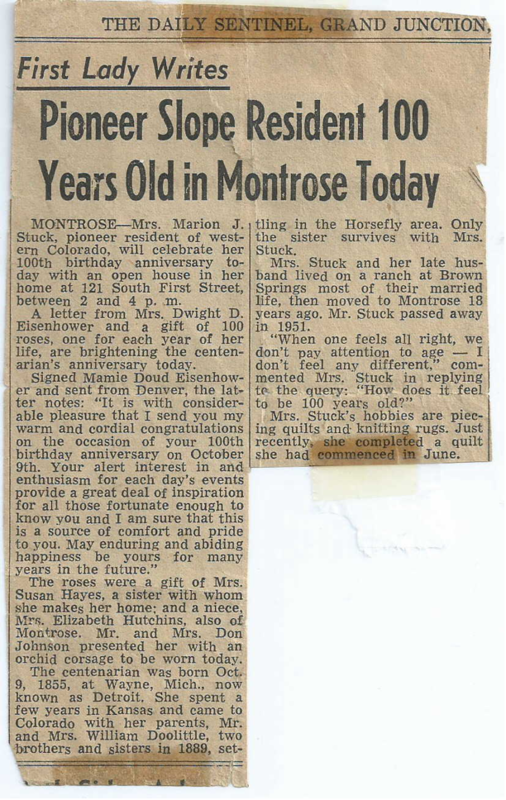 There is no mention of a previous marriage before she met A. M. Stuck in Colorado. Marriage of John Long & Elizabath L. Rooney on the 16 April 1900. John was 40 years old. 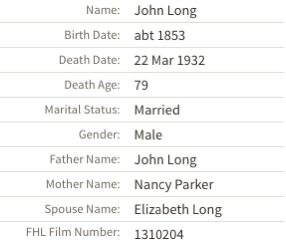 If Elizabeth was 22 years younger than John, then she was 18 when she married. 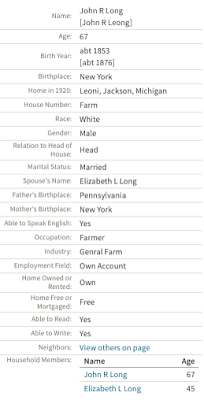 John Long and Elizabeth Rooney in the 1920 Census at Leoni MI. 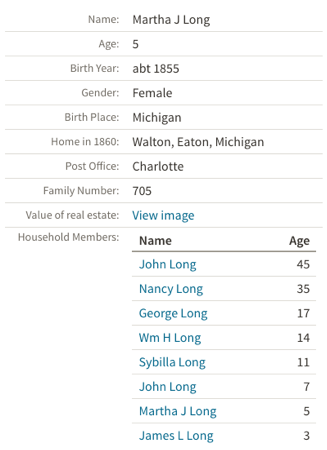 John was 22 years older than Elizabeth. 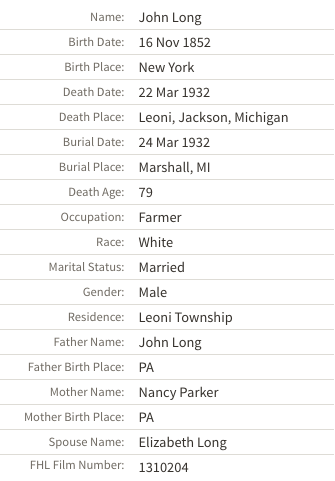 John & Elizabeth in the 1930 Census in Leoni MI. They had a son also called John R. born in 1902.
she is called Elizabeth L. Ranney. The marriage certificate of John Long & Elizabeth L. Rooney. 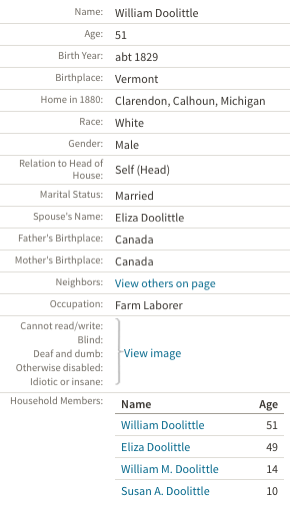 The family of Elizabeth Rooney in the 1880 Census in Fairfiled, Franklin County, Vermont. A document about the death of John Long in 1932. 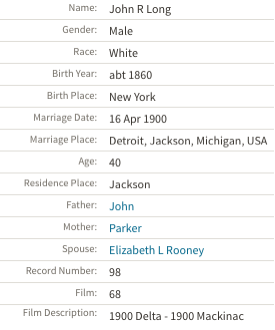 He was married to Elizabeth L. Rooney. In the following document, we learn that he was born on the 16 November, 1852 in New York NY. He died on the 22 March 1932 in Leoni MI at the age of about 80. 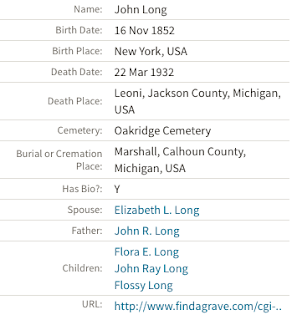 Another document pertaining to the death of John Long.